On Saturday, May 19th, the world watched as Prince Harry and Meghan Markle tied the knot at their royal wedding. And while we got to witness the royal wedding, we didn’t get to see the royal wedding reception (or the after party). Fortunately, Saturday Night Live has us covered. 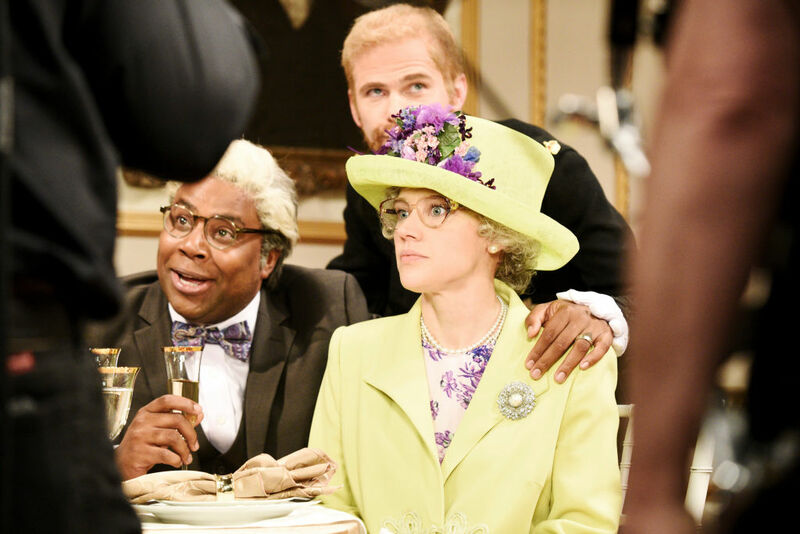 For their Season 43 finale, SNL offered an “inside look” at the royal wedding reception. And it was just as royally rowdy as you might expect. Mikey Day played Prince Harry at the royal wedding reception, going around and chatting with all of the family, friends, and “randos” at the party. But the highlight of the sketch was Kate McKinnon’s portrayal of Queen Elizabeth II. Her subtle shade and generally horrified expressions were perfectly on point. Kenan Thompson played Meghan’s great uncle who was hell-bent on getting McKinnon’s Queen to watch The Crown. He also told her to go to Philadelphia for some “real food.” LOL. Can you imagine what it would be like to sit next to the Queen at a wedding reception? We can only hope that it’s half as hilarious as McKinnon’s impression. But the best part? McKinnon was wearing the Queen’s exact same outfit that she wore to Harry and Meghan’s wedding IRL earlier that day, down to the brooch on her lapel and the purple flowers on her hat. Brilliant. Watch SNL‘s hilarious parody of the royal wedding reception below. We know we probably won’t *actually* get to see what happened at the real royal wedding reception, so this will do just fine.